Indian is just one step away from confirming their semi-final spot in the ongoing ICC WWT20. 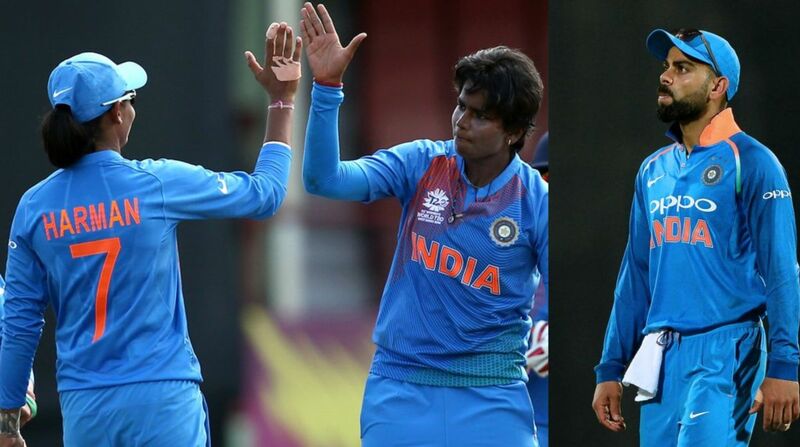 Indian women’s cricket team is just one step away from confirming their semi-final spot in the ongoing ICC Women’s T20 World Cup. With two back-to-back wins over New Zealand and arch-rival Pakistan, Harmanpreet Kaur’s side is currently in the second spot on the Group B points table. India will next take on Ireland on Thursday, 15th November at the Providence Stadium, Guyana. If India wins Thursday’s clash, they will qualify for the next round of the T20I World cup. Ahead of India’s clash with the Irish cricket team, Indian men’s cricket team skipper Virat Kohli has come forward to support Women-in-Blue and started a campaign to cheer them up in the Caribbean Islands. In his tweet, Virat Kohli nominated India’s badminton queen Saina Nehwal, footballer Sunil Chhetri and wicket-keeper batsman Rishabh Pant to join the campaign. In the video, the 30-year-old batsman said he was proud of the women’s tea, and urged people to support them. “I am super proud of our girls, wearing our colours and playing their hearts out. Representing your country and wearing this jersey is a proud moment. This jersey doesn’t care who you are, where you from, what your gender is. Hold up your arm in support of Team India in the West Indies,” Virat Kohli said.